Terry Brumfield owns six lions. Is that irresponsible? A park ranger says that so many pet Burmese pythons have been freed into the Everglades that they’re breeding faster than they can be killed. An Ohio doctor who does missionary work in remote parts of Africa says he has seen more suburban Midwesterners killed in attacks by African animals than people who live in Africa. A bespectacled herpetologist at a secretive reptile market tells a prospective buyer that baby crocodiles like the one he’s holding have “easy-going” personalities. Sometime later — and you may recall this one from the wall-to-wall media coverage in 2009 — a rogue chimpanzee in Connecticut rips a woman’s face off. The Elephant in the Living Room is director Michael Webber’s survey of the allure and hazards of America’s exotic pet trade, told mostly through the eyes of policeman, activist and deadly-animal-wrangler Tim Harrison. We also hear from one of Harrison’s targets, Terry Brumfield, a disabled former truck driver who raises lions for the same reason most people take Zoloft. Harrison is passionate — verging on apoplectic — as he relates stories of constrictors swallowing infants and cougars stalking soccer moms. Then Webber uses Brumfield as a way of de-sensationalizing the issue. For every one of Harrison’s passionate, tear-laced rants against the keeping of wild animals, Brumfield tells a story about how his big cats, Lambert and Lacie, have become his reason to get up in the morning. There’s no doubt the man needs a psychiatrist, but it’s also clear how desperately he loves these animals. After Lambert escapes and harasses motorists on the highway, Brumfield finds himself on Harrison’s radar. 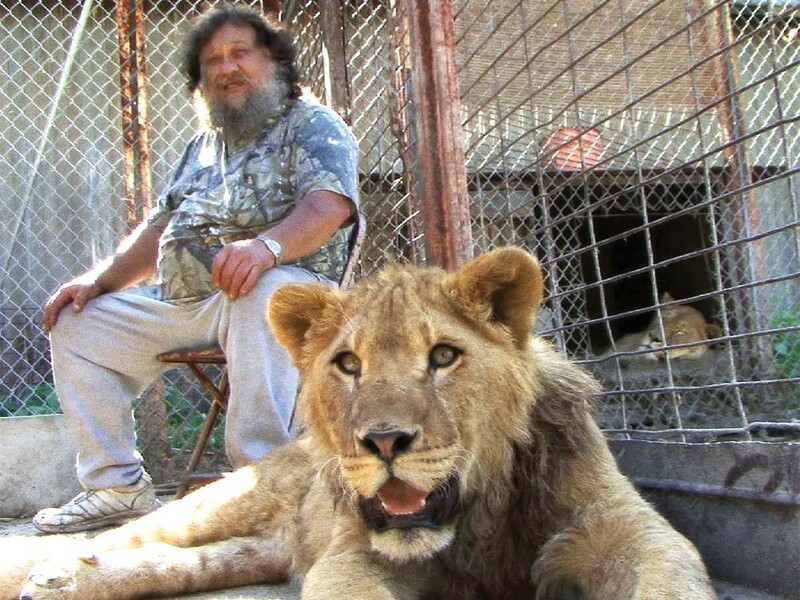 At the time of filming, it wasn’t illegal to own lions in Ohio, so Harrison ends up helping Brumfield build a better cage for the animals. In doing so, the men develop a strange bond. Harrison used to own lions too, we find, before coming to his senses. When he witnesses a live birth at Brumfield’s house, his first emotion is awe and joy. Only later does he worry about the logistics of an obese man with fused vertebrae taking care of six lions. Up to this point in Webber’s film, Harrison has been a talking head. Here, his humanity pokes through. In these moments, too, the news reports and the cautionary tales fall away, and Elephant becomes a rather quiet tale — albeit one with a gruesome climax and heart-wrenching ending — about humanity’s capacity for hubris, but also its need for love. As Harrison and Brumfield become closer, it’s clear that the feelings each man has for these animals is the same kind of stuff. They’re on separate sides of the debate, but their hearts, perverse as it sounds, are in the same place. With characteristic melodrama, Harrison states, “I don’t have any happy endings.” Webber gives Harrison most of the film to build that thesis. It’s only in the character of Brumfield, though, that the crucial, love-laced tragedy of the situation is brought to bear. Without Brumfield, Elephant is a news report. With him, it’s something like art.